Meandering through the sugar at Superstore today, I felt a tinge of inspiration to make peanut brittle. 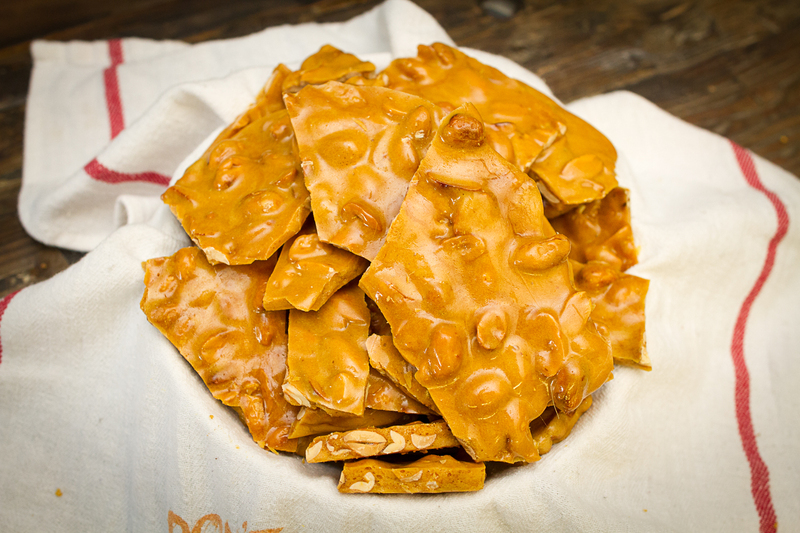 As easy as peanut brittle is, the key is to make sure you have a candy thermometer. Some people live by the water-drop test, but I think they just like to live on the edge. **Just a reminder that if you decided to use salted peanuts like I did, there is no need to add salt. If you use unsalted peanuts add a 1/2 tsp of salt. Grease one or two large cookie sheets with butter. I like using two to make sure I have space to spread the brittle. In a medium sized, heavy pot over medium heat, bring to a boil sugar, corn syrup, and water. Stir until sugar is dissolved. Add the peanuts and stir. Put your candy thermometer in and keep cooking. Stir frequently until temperature reaches 300 degrees F (150 degrees C). Remove from heat and immediately stir in butter and baking soda. Pour at once onto cookie sheet and try your best to spread everything around. Two spoons or forks can help. Once everything is cool, break everything in manageable pieces.